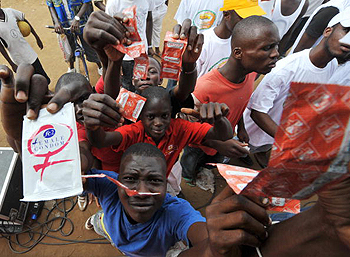 The 2009 AIDS Update reconfirms Africa as the epicenter of the HIV/AIDS global epidemic. The continent represents 10 percent of the global population but accounts for 67 percent of all individuals living with HIV/AIDS, 68 percent of all new adult infections in 2008 and 91 percent of all childhood HIV infections. In addition, 72 percent of AIDS-related deaths worldwide in 2008 occurred in Africa. To contain HIV/AIDS in Africa, South Africa and Nigeria need to play significant leadership roles. South Africa is by far the leading economic powerhouse in Sub-Sahara Africa. According to the World Bank 2008/2009 Africa Development Indicators report, South Africa’s economy represents nearly 23 percent of the economic output of Sub-Sahara Africa. Nigeria is the second-largest economy. Combined, South Africa and Nigeria account for 36 percent of Sub-Sahara Africa’s economy. One out of every four black people in the world is a Nigerian. The country is a leading exporter of oil. It has the largest number of public and private universities and polytechnics in Africa. Nigeria played crucial roles in liberating African countries from the last vestiges of colonialism in the 1970s, 1980s and 1990s, including the end of the Apartheid regime in South Africa. The politics of Africa was dominated in the last decade by former President Obasanjo of Nigeria and former President Mbeki of South Africa, both of whom were highly influential in the founding of the African Union and the establishment of the New Economic Partnership for Africa. South Africa is the dominant political and economic force in the Southern Africa region. Nigeria is the dominant political and economic force in West Africa. Both countries now face significant challenges from the AIDS epidemic. South Africa has the largest concentration of individuals living with HIV/AIDS in one country, 5.7 million and counting. Nigeria has the third-highest number of individuals living with HIV/AIDS, at 3 million and counting. Combined, South Africa and Nigeria account for nearly 39 percent of individuals living with HIV/AIDS in Africa. South Africa needs to lead the fight against AIDS in Southern Africa. The recent announcement of a significant increase in resource deployment for HIV-preventive and AIDS treatment programs by President Zuma of South Africa is a step forward. This should be followed by South Africa’s scaled-up technical and economic assistance to its neighbors in the region. South Africa can team up with Botswana, a relatively wealthy country with successful AIDS programs to provide technical and financial support to other members of the Southern Africa economic bloc. Nigeria needs to ramp up its own HIV preventive and AIDS treatment programs to reach individuals at risk and in need. More than 50 percent of individuals that qualify for antiretroviral therapy do not have access in Nigeria. In addition, Nigeria needs to work with other members of the West Africa economic bloc to significantly improve preventive and treatment programs and keep HIV prevalence and incidence rates low in the region. In particular, Nigeria should work with other countries in the region to prevent runaway HIV epidemic rates in the post-conflict states of Liberia, Sierra Leone and Cote d’Ivoire. Guinea, with its current state of political uncertainty, needs close attention in view of the growing rates of HIV infection. South Africa and Nigeria can lead the way in addressing the continued feminization of AIDS in the continent as a result of gender inequalities. African women account for 60 percent of all individuals living with HIV/AIDS in Africa, the highest rate in any other continent. By setting an example with how they address gender inequalities, South Africa and Nigeria can set important markers for other African countries. They can also provide technical, financial and logistics assistance to other countries in their respective regions to address gender inequalities. Both countries can set examples for other African countries by vigorously tackling poverty, a major driver of HIV transmission. Poverty increases the likelihood of high-risk behavior, including adults taking calculated risks in order to put food on the table for young children and other dependents. South Africa and Nigeria have high rates of endemic poverty and unemployment. Income inequalities are also high in both countries. Finally, South Africa and Nigeria need to continue leveraging their influence in continental and regional organizations to sharpen AIDS response in the continent. They need to continue working within the African Union, the African Development Bank, the U.N. Economic Commission for Africa, and the Regional Office of the World Health Organization to mainstream the implementation of AIDS response into other health and development programs in Africa. Both countries should also work closely to ensure the implementation of the pledge by African countries to achieve universal access to HIV/AIDS, Tuberculosis and Malaria services on or before the end of 2010.